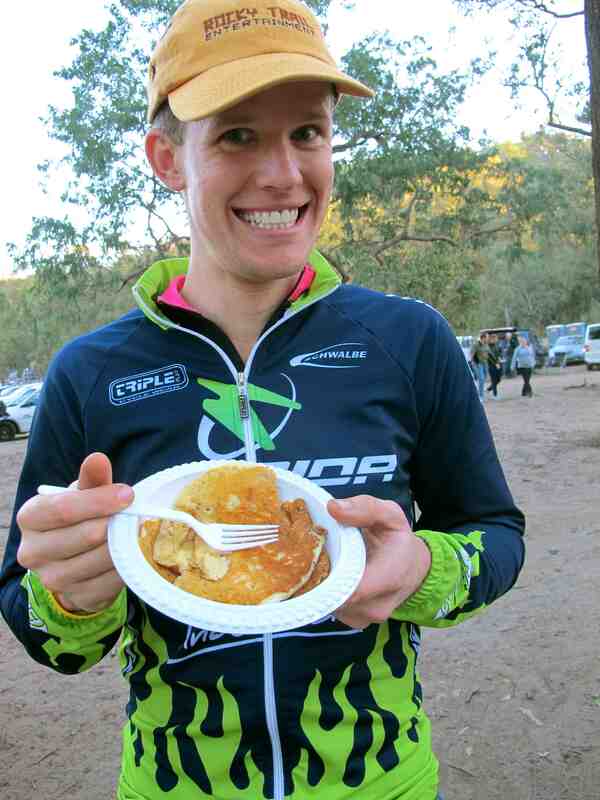 Not much beats post-event pancakes in winter! “I reckon the secret to riding well at something like this is all in the preparation,” I wrote to my teammate, ACT Merida team rider Shane Taylor, before the race. “You’re right,” he replied and we started emailing race prep ideas back and forth as we became increasingly excited during the lead-up to the race weekend. As the third race of the SRAM Singletrack Mind Series got underway, Tails’ preparation couldn’t have been more perfect. He was there early, set up trackside under a big pop-up with everything he needed lain out on a table next to the start straight and rode faster, with more trademark Tails happiness, than any teammate anyone could ever ask for. Unfortunately for both of us, I began to sabotage his prep right from my first lap – where I realised toward the end of the fun singletrack loop that I’d left transition without my number plate or transponder. Riding in the cold morning with numb hands and a double set of gloves, it also appeared that I’d left my bike handling skills in the port-a-loo along with my brain.